Economic Hardship – A Contribution to our Evolution? Yesterday I undertook a workshop for an international customer relationship team at one of my main clients. Personally, I have always had an ambivalence about sales and business development. In my own work, my approach, which I have documented in previous blogs, has been one of “not selling”. In this, I mentioned the story that Ram Dass tells of being on a meditation retreat and sharing a room with someone who was vice-president of industrial loans for a major bank in San Francisco. This individual had originally been a vice-president of industrial loans at this bank but had given it up because the pursuit of wealth and ambition had become unsatisfying. He had left and gone to India to seek a guru and some form of enlightenment. He had returned to San Francisco some years later and bumped into the President of the bank who offered him his old job back and he decided he might as well accept. “Was it different?” Ram Dass asked. The man responded that it was completely different; that before he had been busy being a vice president of industrial loans at a bank but now he went to work and got to hang out with these other beings and the work they did together was industrial loans. I meet many people who are dissatisfied with their jobs and feel that they are not making a contribution to people and that their work has no purpose or meaning. How can being a lawyer, marketing director, etc. etc. contribute to humanity? Of course, ironically, this is the right question if asked as a genuine question – how can my work contribute to humanity? 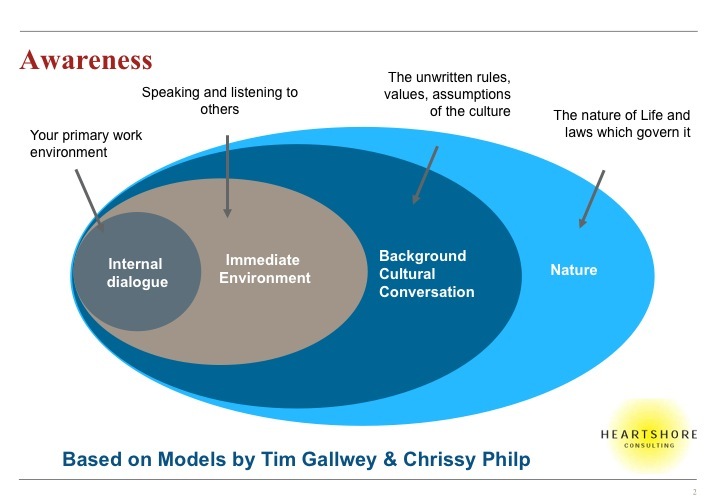 What Tim observed was that when we interact with the world around us we are operating in 3 main contexts which overlap and interact with each other. The first is our individual world, where our internal dialogue is running all the time, trying to make sense of the world around us (in practice there is more going on at this individual level as it is also informed by our emotions, our senses and our intuition. It is only through this individual level that we are able to process changes in the other environments or change and adapt. The Immediate Environment is all the people we are interacting with day to day who provide us with awareness about the world immediately around us. The third circle is the broader environment of all the unwritten rules, values and assumptions which permeate the broader environment. Since these three contexts provide information which is intangible it is difficult for us to create accurate pictures of them and they are also continually in flux which means that we are always updating these pictures or at least, we need to in order to be able to relate effectively to our environment. Tim Galwey’s point was that the greater our awareness of these three environments the more skillfully we are able to respond to them. It is obvious that if we are unaware of something then we cannot respond to it. The last sphere is Nature and this comes from an essay by Chrissy Philp where she put forward a model similar to Galwey’s but which included this sphere of Nature and a further sphere of Cosmos beyond Nature. Since the sphere of Nature is already challenging enough in a business environment I have not expanded the model to include Cosmos thus far! For me, the way I have interpreted this sphere of Nature is in terms of examining the nature of life and the nature of the three other circles, ie. the nature of organisations and cultures, the nature of other people around us and our own nature. The more accurate our picture of these the more effectively we are able to interact with them. There is an added dimension to the nature part for me, which is to try and determine those deeper laws or cycles which are not as changeable as cultural and personal phenomena. One example I tend to use is the fact that it is in the nature of organizations and cultures to be messy and imperfect. Once we recognise and expect organisations and cultures to be messy and imperfect we might chose to act to make aspects of them less messy or imperfect but we do so without the false expectation that we can permanently affect them or change their nature. It is the same with people around us: once we accept their nature we are no longer attempting to mould them into a shape we believe they should be and instead are free to work with their nature. This is the key to the Nature level for me; once we understand the nature of something we can work with its nature rather than wasting our energy fighting against its nature. And still, in typically Sagittarian style, I haven’t got to my original point, but am still busy on tangents to fill in the threads of the story! What was it then that struck me at the workshop I was running for the Customer Relationship Management team? What struck me was that the focus on relationships in business these days, particularly in an environment where business is tough and winning work has taken on a greater premium, might well be part of an evolutionary shift, a shift towards putting the individual human being first and the technical elements of the service you are providing second. That is, that we are learning to value other people as human beings first and then to consider the transaction we are having with them as secondary or in service to the vehicle of the relationship or common humanity. Thus the role of relationship managers and sales people, is actually to help people learn to be interested in others and put the relationship and interaction first rather than seeing them as objects that serve our transactional commercial needs or vessels for the fulfillment of our need to be an expert. Whilst I recognise that, at this stage, much of the focus on developing relationships in business is still somewhat mechanical and self-serving, it is nevertheless an evolutionary step from the previous focus on putting the transaction first and the relationship or human being second. Is it possible that we are evolving to a point where all our interactions with each other will be closer to Ram Dass’s room mates approach, where the various talents and practical skills that we have are in the service of our common humanity? It puts me in mind of one of my favourite series, Star Trek, designed by Gene Roddenberry to act as modern parables. In Star Trek, we get a picture of what an evolved human race could look like, where each individual still brings their individual talents to bear and plays their role but in the service of a common humanity and with a respect for the humanity of each individual, and with the attitude towards alien species, a respect for life itself. I was even intrigued to hear a view voiced among the Customer Relationship Management team that there had been too much focus on profit and this had been dangerous and damaging, that the current environment was a re-balancing, forcing individuals to respect the relationship (and thus individual). Could we envisage a future where everyone; the plumber, the lawyer, the shop assistant, the car salesman meets you as a fellow human being first and then puts their expertise in the service of that common humanity? I think in many instances we already do this; one has only to look at the response to disasters such as the Tsunamis in Asia and Japan to see our ability to put our common humanity first. Yesterday I was going through security for the Eurostar at St Pancras and the man at security took time to smile and talk to me as a fellow human being. The effect on my heart and his stayed with me and passed on to others I met like a ripple in the pond for some hours. Perhaps if we evolve beyond money we can redefine this as “profit” a contribution to our common human wealth – the wealth of our hearts. Back to the CRM team and my earlier point about how to find a job which contributes something to our common humanity. Given the difficulty of the current environment with the pressure, fear, emphasis on profitability, it is difficult to feel that there is any evolution; things feel tougher and less inspiring; a return to the material realities of cost-cutting and treating people like objects. Yet, see this as a person challenge not to be overcome by fear and an “everyone for themselves” survival mode and rather as an opportunity for intense learning about ourselves and how to remain true to ourselves and transform these negative emotions and a huge opportunity to contribute to our common humanity and evolution appears – in fact almost the perfect one. In Star Trek, there are constant complex and difficult challenges which look black and incapable of solution. What I love about it is that these challenges are transformed into deep learning which advance us as a race (and Universe). So it is not a question of searching for a worthwhile or valuable job but searching for how we can transform ourselves and what we do to be of value and purpose. To paraphrase the peerless Don Juan Mateus in the Carlos Castaneda books “It is only when our backs are against the wall that it brings the best out of us and personally I wouldn’t have it any other way”.